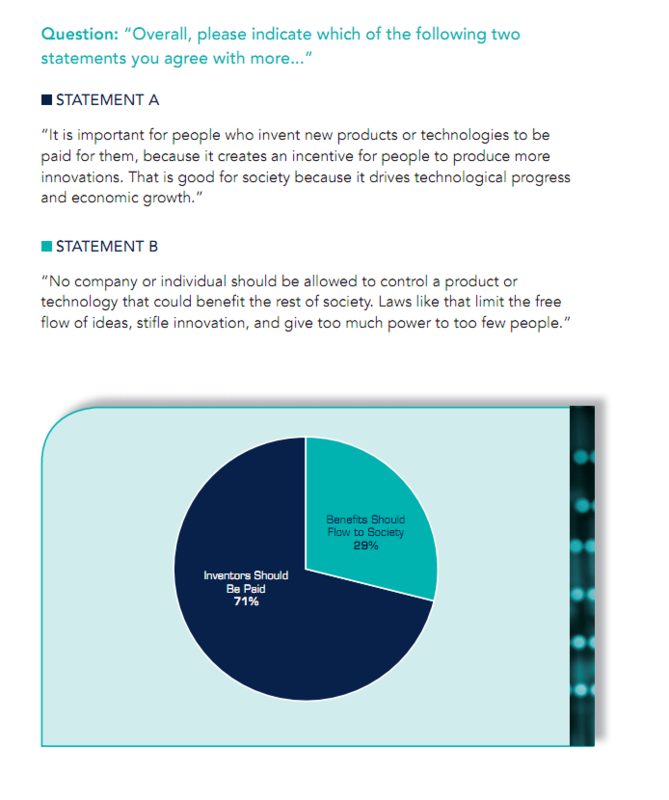 The software industry is being robbed blind,” said BSA President and CEO Robert Holleyman. “Nearly $59 billion worth of products were stolen last year — and the rates of theft are completely out of control in the world’s fastest-growing markets. 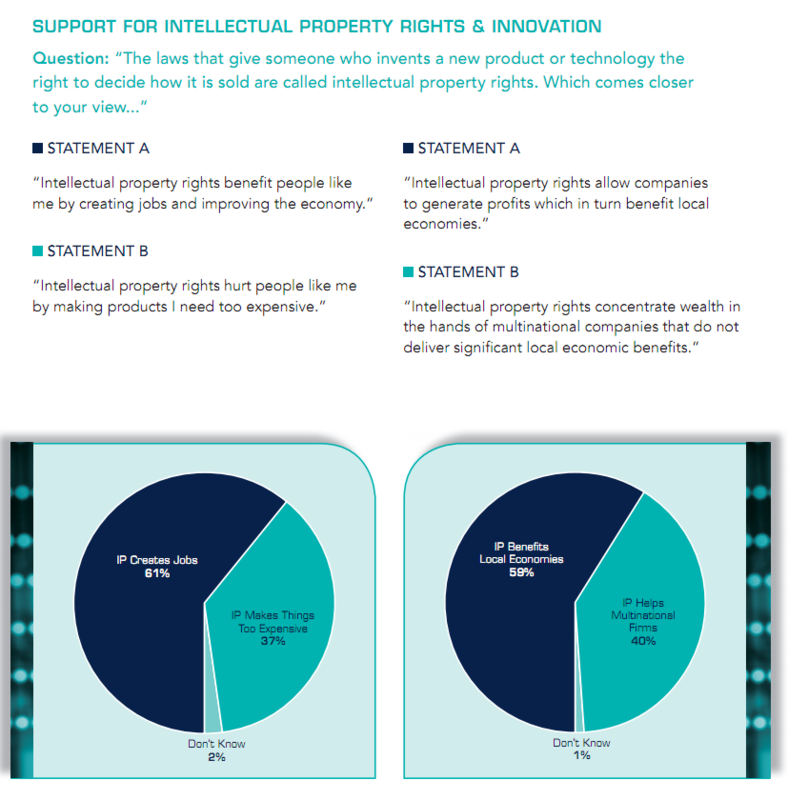 The irony is people everywhere value intellectual property rights, but in many cases they don’t understand they are getting their software illegally. Now, continuing the reforms it introduced last year, the BSA calls these numbers theft and piracy, but studiously avoids describing them as ‘losses’ to industry. That’s because very few people who pirate software would actually buy it at high legal prices, especially in developing countries where price-to-income ratios become astronomical. Instead, the BSA describes the number as the ‘commercial value of pirated software,’ which is technically correct and may even be roughly accurate. But they are no longer making any claims about actual industry losses. (Why did they make this change? Hard to say, but I credit the handful of people who have pounded on this issue year after year–especially Mike Masnick, Nate Anderson [and the Ars Technica writers more generally], and Glyn Moody). 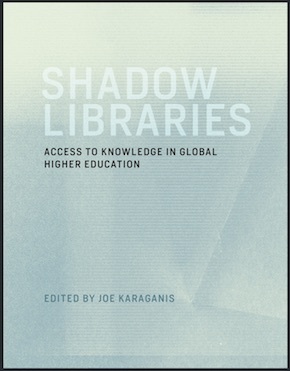 The most common way people in developing economies engage in piracy is to buy a single copy of software and install it on multiple computers — including in ofﬁces. 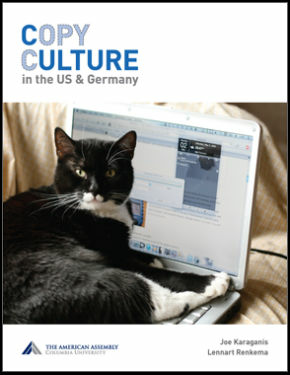 Most PC users believe this practice is legal at home (57 percent in developing economies and 63 percent in mature economies), and about half believe it is legal at work (51 percent in developing economies, 47 percent overall). By the late 1980s every single company abandoned that approach [copy protection] for the simple reason that legitimate customers did not like it. They found that there were times when they needed to make additional copies: they sold the computer and bought a new one and wanted to move their software, or their hard discs crashed and they needed to reinstall it. 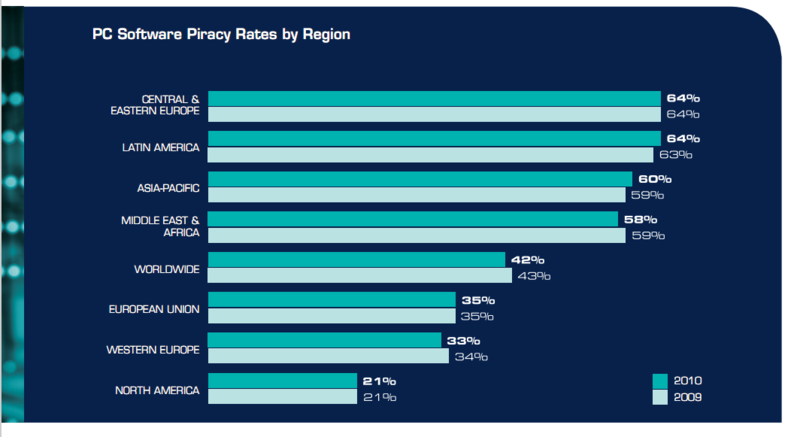 And even though at the time worldwide piracy rates for software were in excess of 80% the need to take care of the legitimate 20% of the market place took precedence over trying to deal with the rest. And that same bias very much exists today, I see it all the time when these issues are debated inside Microsoft (quoted in Katz 2005, requoted in MPEE, p.52). There’s no reason Microsoft or Adobe can’t limit the number of installations from a legal copy to one. But nearly all companies have concluded that the cost of doing so (aggravating customers and diminishing control of the market) outweighs the benefit of whatever sales they would pick up at the margin. We argue in the MPEE report that these network effects associated with piracy are very very valuable. Similar dynamics come into play for companies like Adobe, Intuit, Autodesk, and others that refuse to maintain file format compatibility across releases of their software. Secondarily: Wow. The overinstallation of legal copies is the most common form of software piracy? More common than downloads and the software DVDs said to be pushed by criminal gangs? It appears that BSA has data on this. Why won’t they share? Surely this isn’t commercially sensitive. … provided that one also understands that the vast majority of the ‘legal’ market is furnished through institutional licensing which the end user generally perceives as free. Very few people, in other words, actually ‘choose’ to buy legal software in these contexts. 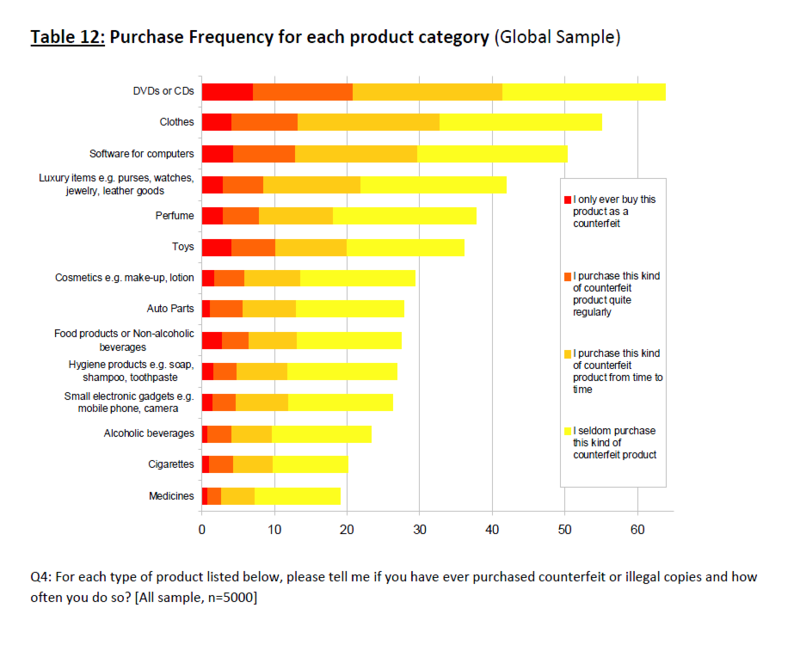 For a better indication of what consumer choice actually look like, there’s always the 2009 BASCAP Research Report on Consumer Attitudes and Perceptions on Counterfeiting and Piracy, another industry report, which at least differentiates practices from attitudes. 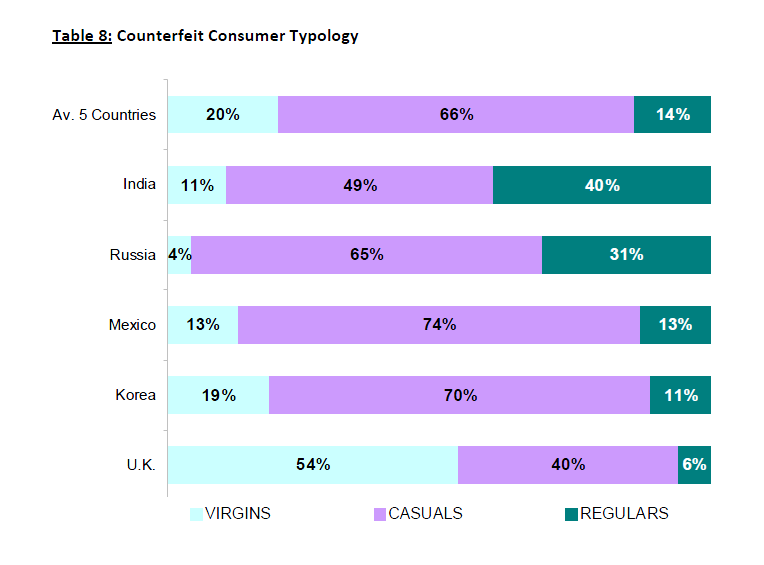 In other words, acknowledged consumption of pirated or counterfeited goods is incredibly common (not to speak of unacknowledged consumption, which is a factor since these activities are often illegal), especially in countries where the economy has a large informal component. So what’s going on here? We’d say that these findings describe a situation in which high-income groups are responsible for carrying the tiny, high-priced legal markets for media goods in poorer countries. Similarly, affordable access to the legal market increases where incomes are higher across the board. Not rocket science, we know. 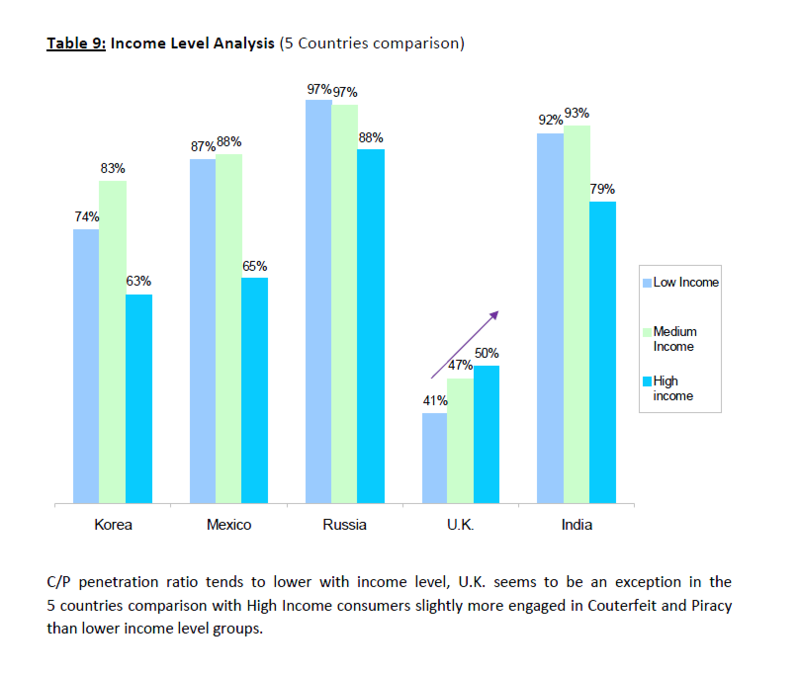 The rising ratio in the UK, we’d also surmise, reflects another factor we document in our report: the greater access to infringing goods that accompanies high rates of computer and broadband adoption. This factor still correlates positively with income and takes on additional importance where the informal street trade plays a comparatively minor role in daily life (e.g., the UK rather than India or Mexico). Mexicans need to be able to trust the person who is telling them about the dangers and wider issues associated with counterfeit and pirated products. A victim of a counterfeit or pirated product would be the most believable, as long as they don’t exaggerate the extent of their injuries. And here’s José Rodrigo Roque Díaz, director of the main Mexican IP industry group, IMPI, veering disastrously away from BASCAP’s recommendations during the recent observance of World Intellectual Property Day by arguing that the problem of piracy is more important than that of narcotrafficking–a genuinely bold statement in a country where narcotrafficking has cost roughly 34,000 lives since 2006. 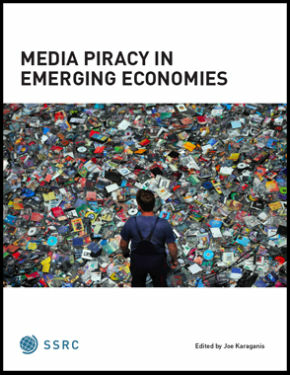 As in many other countries, piracy in Mexico is the product of a complex interaction of forces—among them, the widespread availability of digital media technologies; the high cost of licit media goods; severe, persistent economic inequality; and popular indifference or hostility to enforcement efforts. 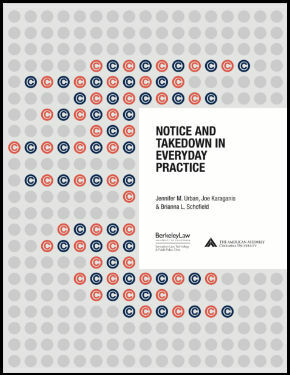 Because the enforcement agenda of the industry groups does not recognize much less address these issues, those groups seem destined to remain on a war footing, struggling to break an economy built on basic economics and ubiquitous consumer behavior. Here, the drug war analogy seems more apropos.